In a medium stainless-steel saucepan, combine the wine, vinegar, oil, onions, carrot, garlic, thyme, coriander, peppercorns, parsley, bay leaves, and salt. Cover and bring to a boil. Reduce the heat to moderately low and cook for 10 minutes. Oil a heavy flameproof 9-by-13-inch stainless-steel or enamel pan. Put the fish, skin-side down, in the pan in an even layer. Pour the hot wine broth on the fish, spread the vegetables over the fillets in an even layer, and sprinkle with the ground pepper. Cover with aluminum foil and bring to a simmer over moderately high heat. 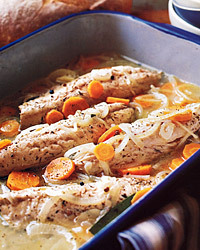 Reduce the heat and cook at a gentle simmer until the fish is just done, about 10 minutes for 1/2-inch-thick fillets. Remove the parsley and bay leaves. Serve in shallow bowls. Fish Alternative Another flavorful fish such as bluefish or shad would be good here. Because these fillets are thicker, you'll need to poach them a few minutes longer. Look for something acidic and refreshing to drink alongside this rich fish. Try a bottle of white wine from the Loire Valley in Franceeither a Muscadet de Sèvre-et-Maine or a slightly more full-bodied Sancerre or other wine made from Sauvignon Blanc grapes.